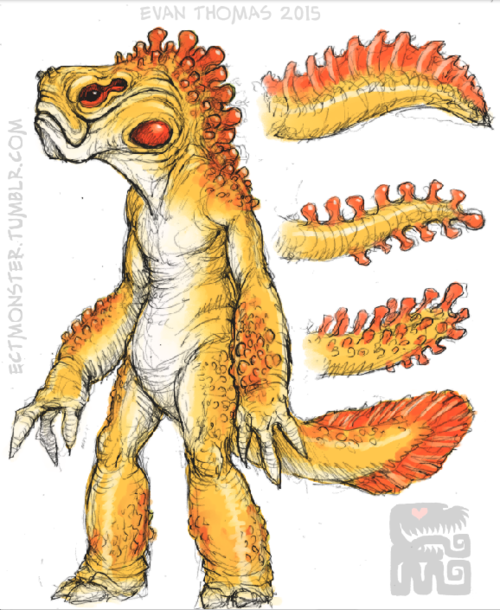 The Yithrahi are an amphibious race of salamander-like creatures who thrive in swamplands and other damp climates. They have existed in Imperial lands for centuries and have a deep connection with their environment. Yithrahi are amphibious by nature, but like toads, are very capable of living outside of water. They are covered with bulbous growths along their backs and possess brightly colored neck pouches that expand with air. They are omnivorous but prefer plants, particularly rice which they harvest in great quantities. Yithrahi’s skin excretes potent toxins which makes them highly poisonous to eat. This defense mechanism has ensured their survival for eons and has allowed them to live alongside dangerous predators that would otherwise hunt them. 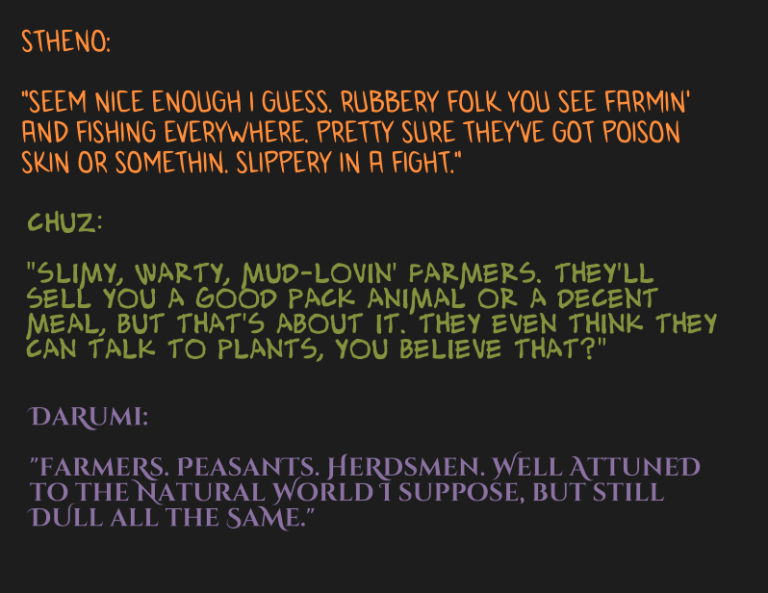 The Yithrahi are a largely agrarian society, and indeed most Yithrahi in the empire make their living as farmers. 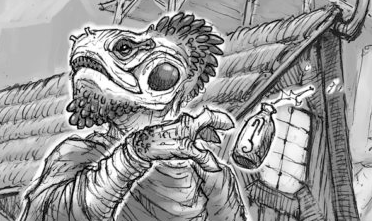 They are among the oldest races to be inducted into the imperial union and their labor forms the backbone of many other race’s food sources. Because of their poisonous bodies, even the most vicious predators have learned to avoid the Yithrahi, who have used this to their advantage in taming and domesticating creatures that are very dangerous to other races. Their affinity for plants and the natural world has made them well suited to animal husbandry, and the taming of steeds and guard creatures is one of their greatest talents. Yithrahi prefer to build their settlements around natural formations rather than replacing them, and do not deforest more than is necessary to build what they need.